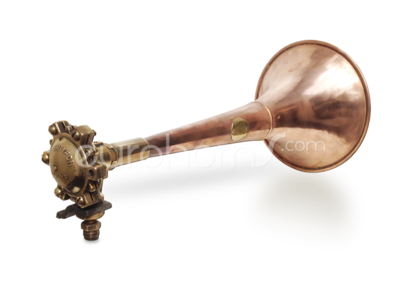 Classic Kockums Supertyfon Shipping Horn. Copper and brass. This classic horn is no longer in production and not for sale, but we have a small collection. Sounds better with the new Kockums membrane. 265 stands for: a frequency of 265 Hz. A solid copper air horn with brass membrane house. Although the horn looks more original with the old membrane housing. It sure sounds a lot better when using the new membrane housings from the Kockum company. In the video you will find Mr Phister testing this combination. This classic Kockum's air whistle horn is no longer in production. ...However; if you are seriously interested, just send us an e-mail.